Sweet Tooth? Are you looking for a sweet treat after a day of soaking up the sun? Luckily Ocean City offers a wide range of yummy choices to satisfy your craving. Ranging from uptown Ocean City or downtown Boardwalk we can help accommodate that sweet tooth. 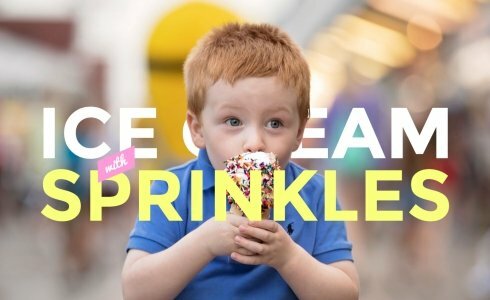 Whether it be freshly baked donuts or cold refreshing ice cream, we’ve got the list for any appetite at any time of day. This local spot specializes in creamy, homemade ice cream. With seven locations in Ocean City you won’t be able to miss the land of dairy. They offer over 15 different flavors such as Banana, Oreo Crush, and Peanut Butter Chocolate-Chip. Any flavor can be transformed into a thick creamy shake as well. For the more adventurous people you can order one of their Super Sundaes. You can try their Monkey Business super sundae filled with banana ice cream, peanut butter topping, and whip cream, or try the Oreo Fluff super sundae that includes oreo ice cream, marshmallow fluff, hot fudge, chocolate Jimmies, and whipped cream! I’m sure you all know what a donut looks and tastes like, but, honestly you’ve never had a true donut until you’ve visited here. The local donut shop makes their warm, yummy confectionaries to order with any toppings you desire. With 13 different glazes and 19 toppings you couldn’t possibly get bored of the donut possibilities! If you’re not good at deciding, don’t worry they provide a speciality menu with donut flavors such as S’mores, Chocolate Covered Strawberry, French Toast, Cookies and Cream, and so many more! Be sure to visit any of the 9 locations in the area, and you won’t be disappointed. Have you ever seen Willy Wonka and the Chocolate factory? Well once you see the overwhelming amount of yummy chocolate and goodies in this shop, you’ll be transported into your very own chocolate factory. 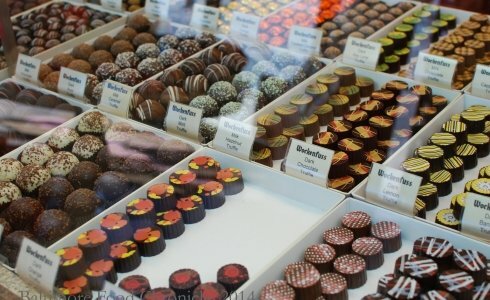 Wockenfuss offers an expansive amount of chocolate confectioneries and yummy sweets. Caramel Apple Pie, Toasted Coconut White Chocolate, and Oreo are just a few of their amazing chocolate covered caramel apple flavors. They also cover other treats in delectable treats in chocolate such as pretzels, oreos, raisins, and even coffee beans! Wockenfuss doesn’t just specialize in chocolate, they also have a variety of candies to indulge in as well. You don’t want to miss out in this heavenly treat spot. As soon as you step into one of the Candy Kitchen’s shops you will be taken into a world of chocolate, taffy, and of course, candy! The colorful store is full of delicious treats for any craving. The shop offers a wide range of candies from sour gummy worms, candy paper, gummy bears, and even chocolate COVERED gummy bears! 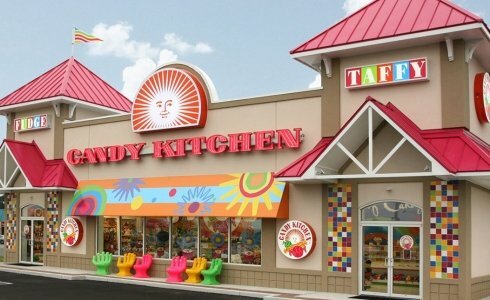 Candy Kitchen is also known for their mouth watering, salt water taffy. The taffy recipe has been around for over 75 years, so be sure to become apart of Ocean City’s history and try one of the yummy taffy flavors offered. They also offered a wide range of chocolatey fudge, with flavors such as Chocolate Marshmallow, Cheesecake, Cookies and Cream, and many more. 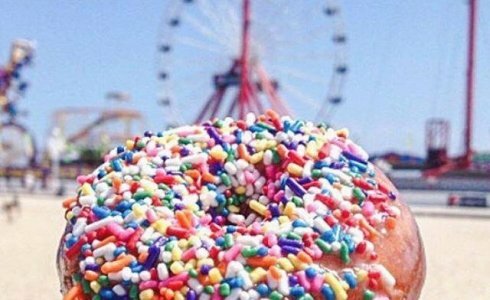 Candy Kitchen offers numerous locations throughout Ocean City, so you won’t miss out. Located in the small town of Berlin, MD, a short 10 minute drive, is this cute bakery. 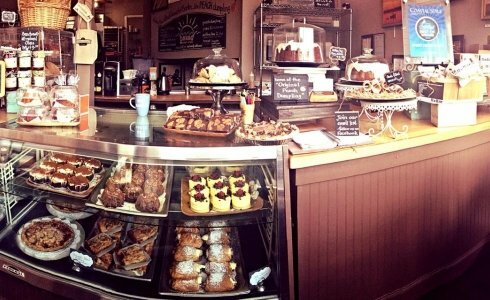 The cafe offers numerous sweet treats, coffee, and more. They take normal desserts and put their own spin on them. Sweet potato biscuits, cupcake bread pudding, triple bumbleberry pie, and soaked bundt cakes are just a few of their amazing signature desserts. They offer different desserts whipped up daily! Be sure to jump in the car, and head to Berlin for this local spot. They also offer mouthwatering lunch options at the cafe as well!